Argonne engineers are the first to capture hydrogen combustion images inside an engine operating at real-world speeds. The red and yellow images show the more intense temperatures. 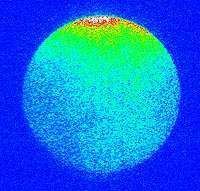 Images of hydrogen combustion have been captured for the first time in an internal combustion engine operating at real-world speeds and loads by engineers at the U.S. Department of Energy's Argonne National Laboratory. This window into the inner workings of a hydrogen-powered engine is helping to optimize the engines for street use some day. Researchers in Argonne's Engines and Emissions Group are experts at imaging the interiors of working engines. A few years ago, their X-ray images of combustion inside a diesel engine revealed a surprising shock wave as diesel fuel spurted out of the fuel injector. This earlier research is helping to improve fuel injectors and increase diesel efficiency. Their current research focuses on hydrogen – the most abundant element on earth – and one of many fuels being evaluated worldwide as a near-term alternative to gasoline. "Hydrogen-powered internal combustion engines (ICEs) are a low-cost, near-term technology," explained mechanical engineer Steve Ciatti, who is the project's principal investigator. "They can be the catalyst to building a hydrogen infrastructure for fuel cells." Some automakers are already viewing hydrogen ICEs as a near-term bridge to the use of fuel cells in vehicles, Ciatti said. Both Ford and BMW already have demonstration fleets gathering data. "Hydrogen ICEs can ease the transition to fuel-cell powered cars," Ciatti said. "We're envisioning a two-step conversion to hydrogen. Using hydrogen ICEs as a stop gap will give consumers a chance to adapt to new hydrogen economy in steps as the new infrastructure is phased in. With these engines, they will still pump fuel into their cars." By using imaging tools and other standard engine measurement devices on a Ford Motor Co. single-cylinder, direct-injection hydrogen engine, Argonne mechanical engineers Ciatti, Henning Lohse-Busch and Thomas Wallner are optimizing engine operation and identifying the root causes of combustion anomalies, such as pre-ignition and knock. These problems are more pronounced at high speeds and high loads. Argonne researchers observe 50 performance measurements during each engine test. Researchers use ultraviolet imaging to capture images inside the running engine. "Hydrogen's visible radiation signature is barely discernible, so we focused on the chemical reactions of hydrogen and oxygen, called OH chemiluminescence, in the engine," Ciatti said. These reactions emit photons in the ultraviolet energy range, and that light is captured and analyzed with specialized optics. "Hydrogen ICEs are a lot like gasoline engines, except the fuel is gaseous instead of liquid," Ciatti said. Hydrogen has wide flammability limits, so the engine does not need a throttle, a device that chokes the air/fuel mixture to control the engine power and hampers efficiency (a standard car today is 25 percent efficient; a hydrogen car will be close to 45 percent efficient), nor do they require exhaust after-treatment when operating correctly. Hydrogen's high flame speed also offers a chance to increase the power output without increasing engine size. Using a direct injection of hydrogen, the power density is roughly 117 percent that of an equivalent gasoline engine – and hydrogen ICEs start easily in cold weather. However, unlike liquid fuels, hydrogen has low energy density per unit volume – which means the vehicle will have somewhat limited range by comparison. The significant increase in efficiency will help to mitigate this characteristic. Researchers are also determining the most efficient and cleanest way to run the engine without knock or pre-ignition, another technical challenge. Because of its nature, hydrogen easily combusts, so researchers are experimenting with a multiple injection approach. They are injecting hydrogen directly into the cylinder once or twice during each combustion cycle, depending upon operating conditions. The goal is to determine the optimum timing and amount of hydrogen injected each cycle. The wrong mixture of hydrogen causes engine operation and emission problems. The researchers are also experimenting with prototype injectors. Making them is a materials science and engineering challenge because the operating atmosphere is unusually hot and under high pressure. Sealing and cooling the injector becomes a critical task. "Working with a single cylinder allows us to isolate problems so we don't have four cylinders to track through to see where and how problems started," explained Ciatti. "We plan to solve problems in the single cylinder and then try them out in a four-cylinder," said Ciatti. The mechanical engineering team has installed a 2.3 liter four-cylinder Ford hydrogen engine and is commissioning it. Eventually, the team will integrate the four-cylinder engine into a flexible hybrid vehicle to test how the engine operates as part of a vehicle in Argonne's Advanced Powertrain Research Facility. This research is funded by the U.S. Department of Energy Office of Energy Efficiency and Renewable Energy's FreedomCAR and Vehicle Technologies Program. Argonne researchers are collaborating with Sandia National Laboratories, Ford, BMW and the European Hydrogen Internal Combustion Engine (HyICE) initiative.